5	stars -	"Review for Channel Islands Jordy Smith 3 Piece Arch White Tail Pad" Mark Taylor This Channel Islands Jordy Smith 3 Piece Arch White Tail Pad is the best Traction Pads I have tried. Jordy Smith was a fan of the CI three piece arch pad but wanted a higher kick and higher arch. After quite awhile of Jordy cutting up multiple different CI pads to make it work, the Jordy Pad was born! Now he is a big fan of his signature pad! 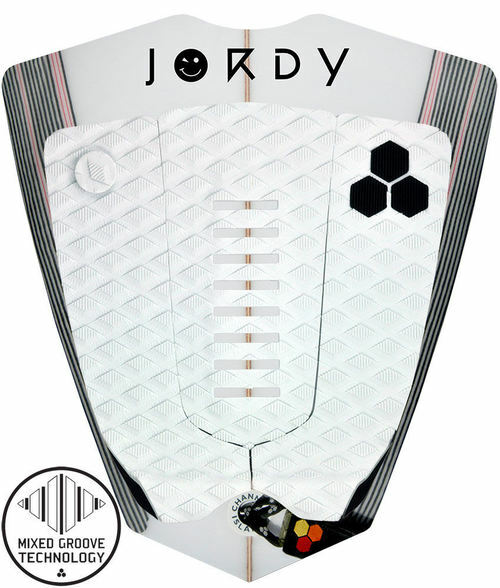 Jordy's pad features mixed groove technology, which is vertical grooves in the traction running front to back. This creates increased traction side to side without disrupting fron to back foor movement.